Ecotourism holidays are essentially a form of tourism involving visiting fragile environments, and relatively undisturbed natural habitats, intended to benefit locals and preserve the natural world. These holidays are low-impact and small scale alternative to standard commercial (mass) tourism. Whether you want to call them eco holidays, responsible travel, ecotourism holidays or sustainable tours, it doesn’t really matter. What IS for sure is that this is key to the type of travel that Tribes loves to organise for travellers such as yourself. Not only are we very good at it, but we’re recognised global award-winners for responsible holidays such as this ”“ so you’ve come to the right place. Welcome - we already have a lot in common! But to help you further, we need to know a bit more about what you’re hoping for with your holiday. 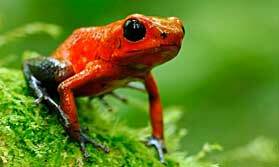 Do you want an ecotourism wildlife holiday? Is it cultural immersion that you’re looking for? Do you need to get out and explore somewhere on a walking holiday? Let’s face it, an eco holiday is a term that covers a lot of options! The holidays have a strong feel good factor for you. These are GREAT holidays! Many people you meet will be conscious of the fact that your presence is of benefit to them, so you should be met with happy helpful people. Most of the places you stay will have a strong regard for their environment, so you are helping to preserve the habitats you have come to see. We at Tribes know these trips and the people behind them really well, and we care about your experience with them. Many of our previous clients have come back from trips simply raving about the excellent time they've had - the authentic experience and excellent fun. We invite you to read our responsible travel pages for information about how travel really can help. Throughout the website you will see small red hearts on some of the holidays and places to stay. This is how we flag up to you which trips and lodges/hotels are making a difference in some way. All the holidays, and some of the accommodations (we're slowly working through these currently) have explanations as to how they help on the web page. You might also want to look at our HOLIDAYS WITH HEART page where all the details of how each of these trips help are explained. 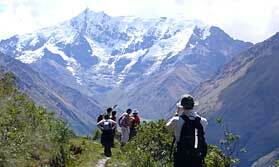 Hike through stunning volcanic Andean scenery. Stay in comfy lodges and haciendas each night. Reach the peak of Pasachoa (4,200m). Get to the lowest peak of Ruminahui (4,600m). 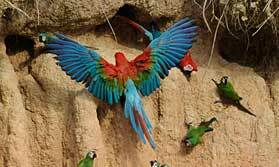 Spot Andean condors, wild horses and other wildlife. Enjoy gorgeous landscapes including glaciers and Limpiopungo Lake. 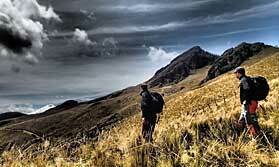 Choose from a 4 or 5 day itinerary without summiting Cotopaxi. Take 8 days to include summiting Cotopaxi. 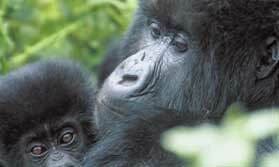 A gorilla express safari! With one gorilla trek and one golden monkey trek. A great opportunity to view tigers in the wild as well as see the iconic Taj Mahal - a majestic combination! TIGERS !!! 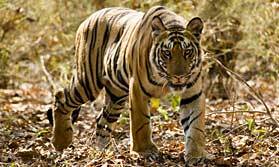 We certainly hope to see tigers! Spend valuable family time discovering Kenya on safari and at the beach. 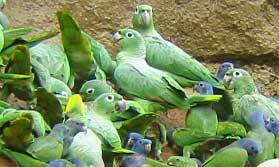 Experience the rich diversity of Costa Rica's ecosystems and marvel at the array of bird and animal life at wildlife hotspots. Sample the produce at the end of a chocolate tour! A 3-centre safari holiday showcasing Botswana's diverse flora and fauna, offering you the chance to support vital rhino conservation projects. 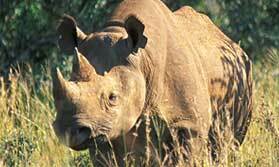 Contribute to the Botswana Rhino Relocation and Reintroduction Project. Explore 3 varied regions of Botswana - the Delta, Chobe and Makgadikgadi. Stay in top quality camps and lodges. Take a mokoro ride in the Okavango Delta. Search for wildlife on day and night drives. This safari takes you to 3 of the best wildlife locations in Tanzania, staying in comfy lodges and camps throughout. 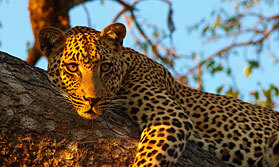 An excellent quality group (or private safari) in northern Tanzania. Good quality camps and lodges throughout. Great guide with you for the safari. 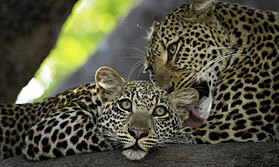 Highlights are Serengeti, Ngorongoro Crater, and Manyara or Tarangire. A rare chance to accompany members of the Zambian Carnivore Programme as they track lions, hyenas and wild dogs in the Luangwa Valley, intersperced with safari activities. Experience the rich wildlife and stunning scenery of South Luangwa National Park, and the sheer majesty of Victoria Falls in this superb 11 day holiday. Calling all elephant-lovers! This is the trip for you. 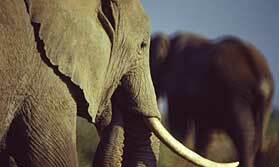 A trip made for elephant lovers! 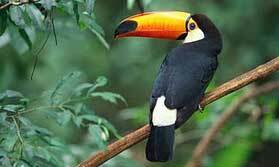 Rio, the Amazon & the Pantanal - a fantastic wildlife odyssey in Brazil. Live it up in the party city of Rio! An unforgettable perspective on Inca culture. 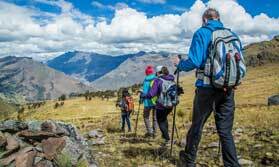 Spend 5 days in Cusco and the Sacred Valley and 6 days trekking in the Peruvian Andes, memorably finishing at the fabled 'Lost City of the Incas', Machu Picchu. See regions of Tanzania that few people visit. 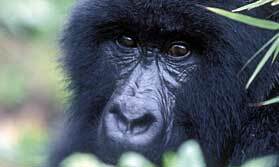 Spend time with chimpanzees in the Mahale Mountains National Park. 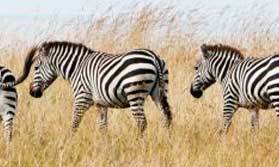 Experience the stunning wildlife and gorgeous scenery of Ruaha. 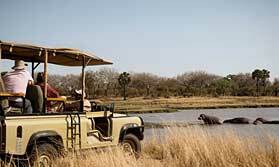 Enjoy game drives with experienced professional guides. 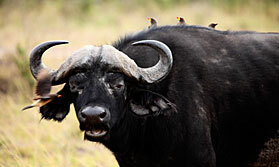 Watch elephants and buffalo from your camp in Katavi. Stay in small camps with friendly, welcoming staff. Let us help you plan your perfect tailor-made holiday. Contact us and speak with one of our travel experts.